I went to a plant show today and found the plant that I’ve been wanting to own for ages now. It’s an easy enough plant to find plant. But I’ve never had a chance to actually buy one before. 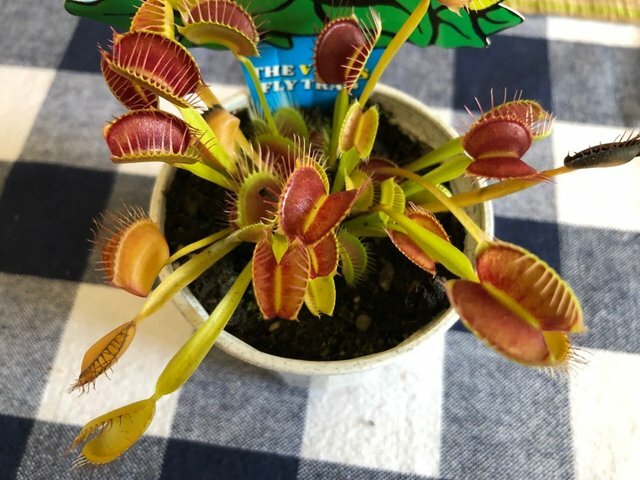 So now I have a fly eating dude in my plant collection. Whose name is Dude. I’ve never named a plant before. Is that a weird thing to do? Oh yeah! Dude needs some #GooglyEyes! They are pretty damn awesome. My house is weird though, there's no obvious spot to keep him so I might need to build something. Duuuude! Classic. Have fun feeding it flys. Yupp I'd like to get once such plant. But unfortunately didn't see them on sale here in Russia just in botanical garden. I think you need to poot nearly with him slowmo camera and make a video how it catches somebody. I also need a nice spot to keep the little guy. I think you can choose it with your second half!